Inventory We are a resale marketplace, not a box office or venue. Ticket prices may exceed face value. This site is not owned by Colonial Theatre Boston . The Colonial Theatre has been bringing some of the best traveling Broadway shows to Boston for over 100 years. The Colonial Theatre Boston opened on December 20, 1900 with a Ben-Hur performance that was technically and mechanically way ahead of its time. The Colonial Theatre box office is located at 106 Boylston in downtown Boston, Massachusetts. 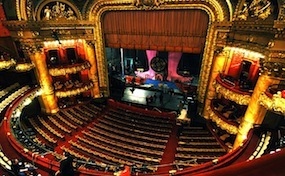 The venue is known for many Broadway producers to preview shows before bringing them to New York City. Colonial Theatre Boston tickets have included shows like Avenue Q, Mamma Mia!, Jersey Boys, The Producers, Les Miserables, and Spamalot. The venue has also undertaken a major restoration in 2004 and 2007 to provide theatre goers with the finest of new and old accommodations. Colonial.Theatre-Boston.com is a independently owned and operated company that specializes in all online sales in the secondary market. We are not currently affiliated with any official supplier, website, or primary box office. Ticket prices may range above or below face value and can change at anytime with market conditions. To order tickets to all Colonial Theatre Boston events simply click on the performance of interest and follow the steps online or pick up the phone and call our operators at your convenience.